Being in the fashion industry means that you have to schmooze (read: network as a professional) at events. But being a fashion business owner means that you have to effectively network with a range of people, at a number of different events. This can be a nightmare if you hate networking, if you believe that you’re just really bad at it, or worse still, if you just don’t have the time. But it doesn’t have to be a nightmare. The thing to remember is that everybody has an agenda when networking; people either want to promote something or get something from someone else so that they can get on with selling something. Networking should be a great way for any fashion start-up owner to build up a strong bank of contacts and links to resources. 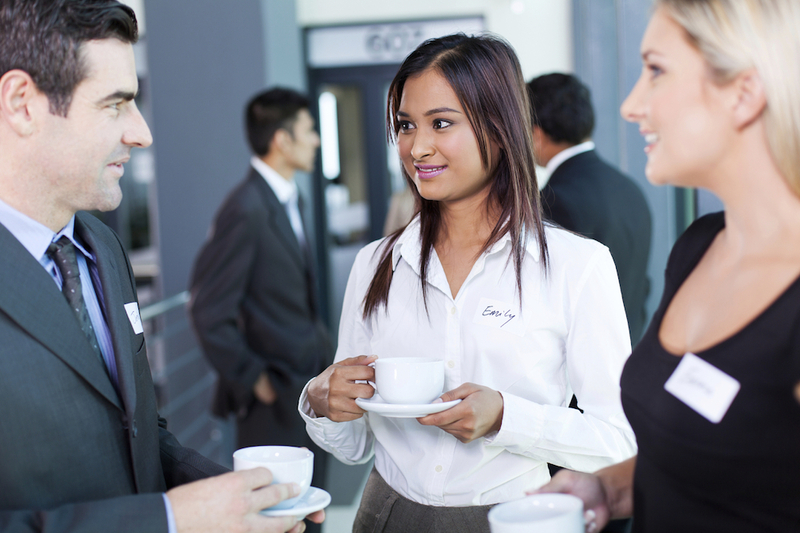 Here is some advice for fashion professionals who want to learn how to network. If you need a mentor, or a graphic designer or a web developer, find a way of finding them. The best way to do that is to ask people what they do once you’re at the event. Or better still, attend an event that you will actually benefit from. Enterprise Nation has a great list of events targeted at start-up businesses, and you can filter to your heart’s content on EventBrite. Don’t waste your time at events that sound great but won’t satisfy your end goal. Quickly and clearly. You should be able to say your name, your company name, what the product or service that you provide is about, why you’re at this particular networking event, and what you’re hoping to get out of it in less than three minutes. But at a normal speed, and whilst looking enthusiastic. Simply, be human in your approach. Imagine you’ve bumped into a good friend that you haven’t seen in five years at the metro, and there is four minutes before your train arrives, and you both want to share the successes of your career and what you do in that time. That’s the delivery you want. Stay and listen to your new contact’s networking pitch too! It’s only polite. Then try and introduce them to someone or a brilliant service that helped you. They’ll love your interest in what they do and maybe even feel as if they need to repay the favour. And also, you know, it’s nice to be nice. Building a relationship with someone who you think could help you in the future is obviously helpful, and building a rapport with someone in the same boat as you can just be good for morale. Go with your gut when you meet people and be led by that instinct. You don’t always have to make new connections! Sometimes you don’t even have to leave the house to network. Get those old diaries out, join a group on Facebook or search a hashtag on Twitter to find like-minded fashion entrepreneurs. The world is becoming more virtual and there’s no shame in networking that way too. As long as you’re genuine in cultivating a conversation and honest about what you need, there’s no reason why a contact you meet via a webinar or platform like FASHION INSIDERS, will not be as helpful as someone you meet in person. And if you do go to a networking event and bump into someone you’ve met before, don’t be afraid to remind them of your meeting and what you’re looking for. If you’re really shy or nervous about networking, new to the fashion industry or unable to speak the language; bring along your confident fashion/multilingual friend. Having that support is invaluable and it will only cost you a drink and maybe a favour. Sometimes people find it hard to cross over into different industries, or will not have English as their first language. Both are fine and can be worked around with the help of a friend or Google Translate (if you’re networking online). Have a couple of questions that you can rely on if you get tongue-tied or worse still, have a mind blank. Learn these by heart and make sure that they’ll deliver the answers you want. It’s important that you have questions ready as well as information about what you do, especially if you’re looking for something or someone. Without questions, how will you know if you’re being offered what you want or if you’re barking up the wrong tree? Make sure that you have a great ending point for your script too. Make sure that you, your brand and what you wanted from that person are memorable. Be interesting and have a token that they can leave with, like a well-designed and informative business card. The chances are you’ll be smiling, and not only does a smile put people at ease but it will encourage conversation! When you’re busy setting up your own fashion business, it is likely that you’ll lock yourself away in your office and have little communication with the outside world at times. So relish the opportunity to get out and engage those communication skills, for your sanity alone.